RUN FOR YOUR LIVES! IT'S MOUNTAIN MAN! Wouldn't you know it? 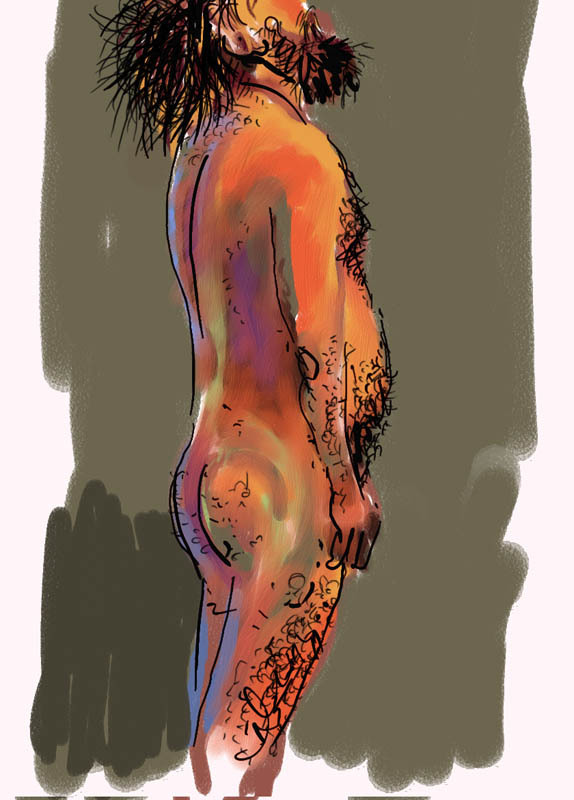 The night I'm able to return to Figure Drawing Group (aka Nekkid People), here comes Mountain Man. He is an hairy man. Everywhere there's a crease, there's hair coming out of it. It's like The Man With 1,000 Armpits. As luck would have it, my battery ran down after one pose, so I had to cut my participation short. I mean, my computer's battery ran down. I'm suddenly reminded of an anecdote from the misty reaches of my past. When I was a kid, I played the trumpet. You know how in 3rd grade or thereabouts it was suddenly time to pick an instrument to try to play, and all the boys picked trumpets and all the girls picked clarinets? So I had a trumpet. And my mother gave piano lessons after school. And a girl I had a crush on started taking lessons from her. And when she came for her first lesson, I got shy and retreated to my room and started cleaning my trumpet. And when my mother called "Honey, Janie's here! Don't you want to come out and say hi? ", I shouted, "I CAN'T! I'M OILING MY VALVE!" I've never lived that one down in family circles.